The researchers are working to develop an anti-venom against several species of snakes. London: Scientists have developed an experimental anti-venom against toxins from the world's most feared venomous snake, the black mamba, which is found in Africa. The findings may lead to a paradigm shift in snakebite treatment, said researchers at Technical University of Denmark (DTU). The leap forward in our experiments is that we used a biotechnological method to find and then propagate human antibodies in the laboratory to enable use in the treatment of experimental black mamba envenoming," said Andreas Hougaard Laustsen, an associate professor at DTU. 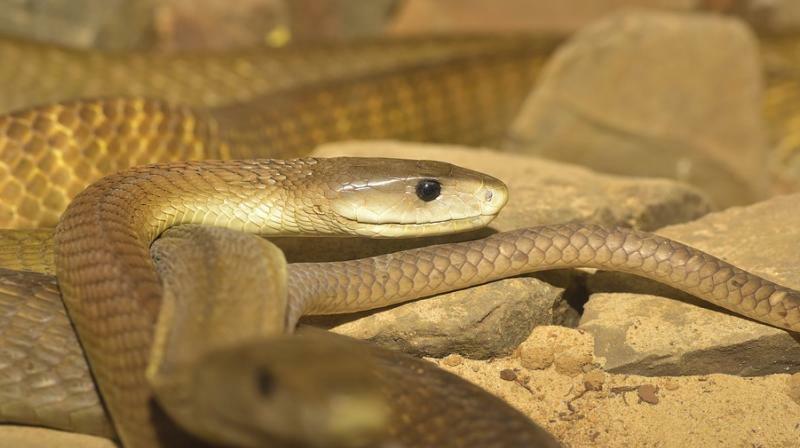 “The method we employed can be used to discover human antibodies in the lab by simulating of the human immune system, so we can avoid injecting patients with snake venom to raise antibodies by immunisation," said Laustsen. The antibodies for the experimental black mamba antivenom were discovered using an antibody library containing human antibody genes extracted from white blood cells in donor blood. These genes were inserted into genetically modified virus particles that can express the desired human antibodies on their surfaces. These virus particles were then used to screen and find human antibodies that can bind to black mamba dendrotoxins, according to the study published in the journal Nature Communications. After the correct antibodies were found, the antibody genes were inserted into mammalian cells acting as cell factories with a large output of monoclonal antibodies. The discovered antibodies can be used in the industrial setting for large-scale production in huge fermentation tanks, similar to insulin production today, researchers said. Laustsen estimates that it will still take years before production of antivenom based on human antibodies is ready to go beyond the laboratory. "We have shown that it is possible to produce an experimental human-based anti-venom against important toxins from one snake species, the black mamba," said Laustsen. "Before clinical testing of the anti-venom on humans will make sense, it is relevant to develop more antibodies for the anti-venom to give it a broader spectrum against several types of snake venom," said Laustsen. If the research is successful, physicians will be able to use the anti-venom in the many cases of snakebite in which the snake species is unknown. This can potentially save many lives, not only in Africa, but all over the world. More than 100,000 people annually die of snakebite envenoming, and many more are disabled, researchers said. Given that most snakebites occur in poor areas of the world, this is not a main focus area for the pharmaceutical companies, they said. Do you think the first life form might have bred in pond?